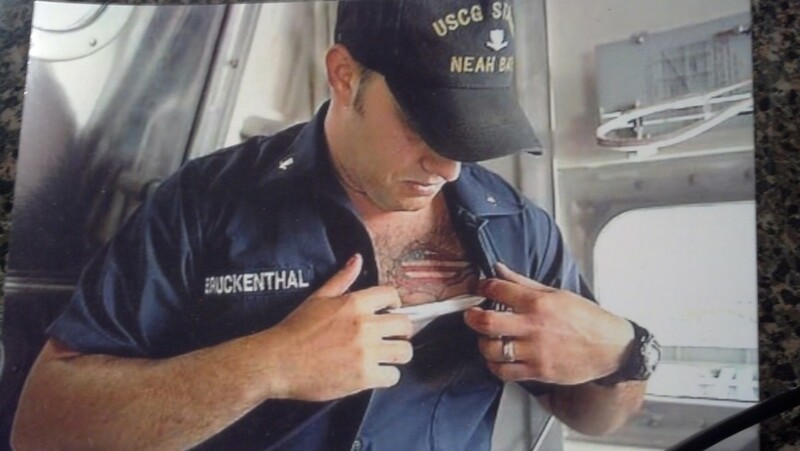 Nathan B. Bruckenthal, United States Coast Guard Petty Officer, lost his life while serving his country. He is the first and only Coast Guardsman to be killed in action since the Vietnam War. He was 24 years old. Those of us who knew him and loved him believe that his heroism stemmed from a familial sense of service; this sense of service was instilled in Nate at a very young age. Nathan was born on July 17, 1979 and grew up in Stony Brook, New York. He was a member of the Navy Junior ROTC while attending Herndon (VA) High School. After graduation he joined the Ridgefield Connecticut Volunteer Fire Department. He moved back to Long Island and subsequently joined the Coast Guard in 1998. Unit Commendation Award. Later he requested and was sent to Yorktown, VA, for training as a damage control officer. This led to his next assignment in Neah Bay, Washington. It was there at Neah Bay he met his wife Pattie Bruckenthal nee Rombo. His decision to extend his enlistment was based on his desire to continue to serve his country in an even more challenging position in the Coast Guard. He was accepted to the elite tactical law enforcement program and assigned to TACLET South, housed aboard Air Station Miami. He was recognized as a leader by his commanding officers and received numerous awards for drug extradition operations and alien interdiction in the Caribbean Sea and eastern Pacific including the National Defense Service Medal, Coast Guard Merit Team Commendation and the Global War on Terrorism Medal with oak leaf. Because of his unique skills and abilities he was chosen to be among the first Coast Guardsmen deployed to Iraq during Operation Iraqi Freedom in early 2003. While there he received the Armed Forces Expeditionary Medal and a Combat Action Ribbon for action in and around the port of Um Qasar. In March 2004, at the request of his command staff, he volunteered for a second deployment to Iraq. Only weeks after discovering that his wife was carrying his unborn child, Nathan Bruckenthal and two U.S. Navy sailors were killed when a suicide bomber attacked their rigid hull inflatable boat. Nathan had been chosen to become a part of the Taclet’s training unit and his job that afternoon was to instruct navy personnel how to conduct maritime interdiction operations. The team observed a suspicious vessel, which did not heed their commands. The team intercepted the vessel. This selfless act of courage protected the crew aboard the U.S.S. Firebolt, the off-shore oil platform and the oil terminal itself at Khawr Al Amaya, in the northern Arabian Gulf. For this action, Nathan was posthumously awarded the Purple Heart Medal, the Bronze Star Medal with Valor, the Global War on Terrorism Expeditionary Medal with oak leaf, and his second Combat Action Ribbon. He was laid to rest with many of America’s best at Arlington National Cemetery. Nate is the first Coast Guardsman killed in action since the Vietnam War. Nathan Bruckenthal will always be remembered for his kindness to others, sense of humor, devotion to his family, and service to his country. Nathan’s daughter, Harper Natalie was born on November 19, 2004. Pattie and Harper moved to Ashburn, Virginia. Pattie attended and graduated from George Mason University’s School of Nursing. It is her desire to serve in a military or veterans’ hospital…in a small way she can give back to all those who have helped her and Harper. Nate has been remembered in many ways. The barracks at Station Montauk, where he first served, have been renamed Bruckenthal Hall; Nate’s Open Door Baby Pantry & Exchange, is a not-for-profit baby pantry that assists military and civilian employees who work in the greater Baltimore area; Taclet South has permanently placed a plaque bearing his likeness at their facility; his brothers spearheaded a community service project while serving in their local junior fire department and an Operation Iraqi Freedom and Operation Enduring Freedom monument honoring those who served now stands in Northport: it too bears his likeness. His story has been published in Faces of Freedom (www.rebeccapepin.com.) Three coins have been minted acknowledging his sacrifice. The Crescent City California U.S. Naval Sea Cadet Corps has honored Nate by naming its division after him. In January 2009, the Surface Navy Association added Nate’s name to their Hall of Fame. On October 29, 2010 a new fitness center was dedicated to Nate at the Base Support Unit at Sand Pedro, California and a service dog has been named after Nate (www.vetsfwd.org.) These are just a few of the testaments to Nate. But his greatest legacy is his daughter, Harper. We are so fortunate to have a little piece of Nate within her. I am there to hold you. I am there to protect you.